Addis Ababa, Ethiopia’s crowded downtown streets are soon to get some relief as the city prepares to open its first major public transport system, a light rail. Photo by Sam Effron/Flickr. East Africa doesn’t make a lot of headlines for its sustainable transport achievements. That’s changing, as its cities are starting to pioneer innovative new projects to bring urban Africa into the spotlight for sustainable development. The challenges in the region are many. According to the African Development Bank, rapid urbanization in sub-Saharan Africa has led to a rise in informal housing, poverty, and social inequality. This has resulted in not only insecurity and crime, but also intense traffic congestion, as demand for modern transport has increased faster than cities can provide it. In turn, mounting gridlock is creating health and safety risks, impeding economic development, and producing more greenhouse gas emissions despite Africa’s historically small carbon footprint. Because of these cities’ aging transport systems and struggles with road safety, it is time for city leaders to focus their attention on creating urban transport solutions. In response to these challenges, Addis Ababa, Ethiopia recently launched pre-testing of its first light rail system (LRT) prior to an official launch scheduled for May 2015. This first phase was well-attended by government officials, foreign dignitaries, and thousands of residents in support of the new development. Addis Ababa’s LRT is expected to help mitigate carbon emissions from transport and reduce travel time for commuters. 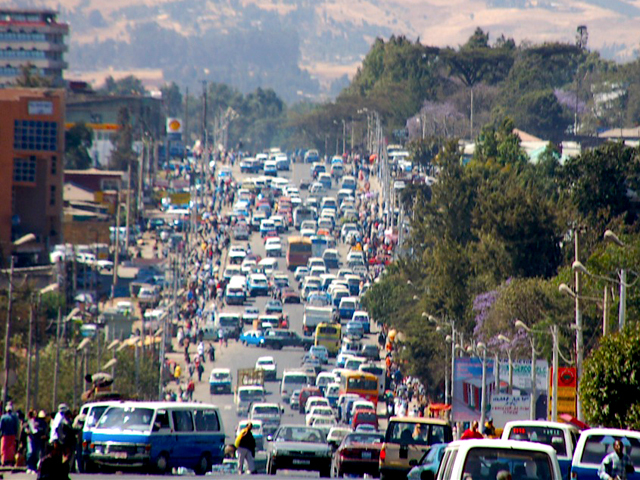 In an effort to address global and national concerns over climate change, the Ethiopian government has been working to ensure that its citizens will benefit from a modern, low-carbon transport system. Additionally, the system has been designed to be comfortable, efficient, reliable, and affordable. Furthermore, the initiative has support from the top down. “The successful completion of Addis Ababa’s light railway project is a testimony of the fruitful journey towards Ethiopian renaissance and [that] the government would continue to invest in infrastructure expansion to fuel [the] socio-economic development of Ethiopia,” said Mayor Dirba Kuma. Addis Ababa also has plans in progress for a future bus rapid transit (BRT) system, and this week welcomed a new City Advisor for low-carbon development through its role in the C40 Cities Climate Leadership Group. Not to be outdone, regional peer Dar es Salaam, Tanzania is also developing a 20.9 kilometer second phase of its BRT system, which will provide the necessary transport backbone for ensuring economic growth. The two cities hope to collaborate and learn from each other’s experiences advancing sustainable urban transport in the region. In some transit-oriented development (TOD) projects, the property values surrounding light rail stations rise to the point where poorer families are no longer able to afford housing or maintain their businesses. To prevent this, the government of Ethiopia is working closely with Arup South Africa to make transport hubs along the new system walkable and accessible while allowing for flexibility as the areas around stations develop. Arup South Africa will design a transit-oriented development master plan and illustrate potential future development as in the short, medium, and long-term. This kind of planning is aimed at ensuring accessibility, connectivity, and efficiency. Additionally, Addis Ababa’s LRT system has prioritized accessibility for disabled users. Along with affordability, this has been one of the key elements lacking in public transport systems in African cities. What’s next for sustainable transport in sub-Saharan Africa? Ethiopia’s light rail transit-oriented development initiative is a big step towards addressing the challenges rising from urbanization in the region and ensuring prosperous, equitable, and sustainable cities. As African cities continue to grow, more city governments should take the opportunity to learn from Addis Ababa’s experience and apply these lessons to their own efforts to plan integrated, sustainable public transport systems that prioritize moving people, not cars.